This beautiful Oneness UUA Stole features the Flaming Chalice Symbol on the right front side and the Oneness Symbol on the left front. It is available in numerous brocade colors with coordinating lining and fringe. For a chart of available fabrics, Click Here. The UUA stole measures 42" from the nape of the neck down to the end of the fringe and is 4.5" wide. 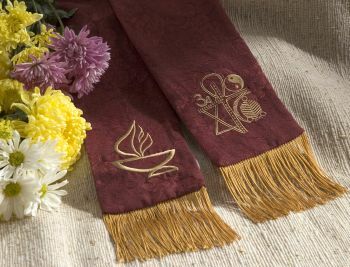 All our stoles are suitable for any function in any season of the year and worn comfortably and confidently by both men and women. We have chosen a rich but subtle antique brocade, lined with a satiny polyester fabric of the softest sheen with matching 4-inch chainette fringe. Allow 2 to 3 weeks for delivery. Rush orders are available if time is short!